Bridal party gifts, perfect for winter weddings. This listing is for any (1) necklace with a snowflake pendant. Ask us about the FREE Personalized notecards and jewelry boxes. Sterling silver chains also available for an extra charge. Ask Bridesmaid, Bridal Party Gift, Handstamped necklace. Other Color Pearl Available. FREE Notecard Jewelry Box. Skeleton Key, ask Bridesmaid, Flower girl, Handstamped charm necklace. Other Color Pearl Available. FREE Notecard Jewelry Box. Anchor, ask Bridesmaid, Flower girl, Handstamped charm necklace. Other Color Pearl Available. FREE Notecard Jewelry Box. Godmother, ask, cross, handstamped Necklace. FREE Notecard Jewelry Box. Flower girl necklace, personalized, rose, FREE notecard and JEWELRY box. 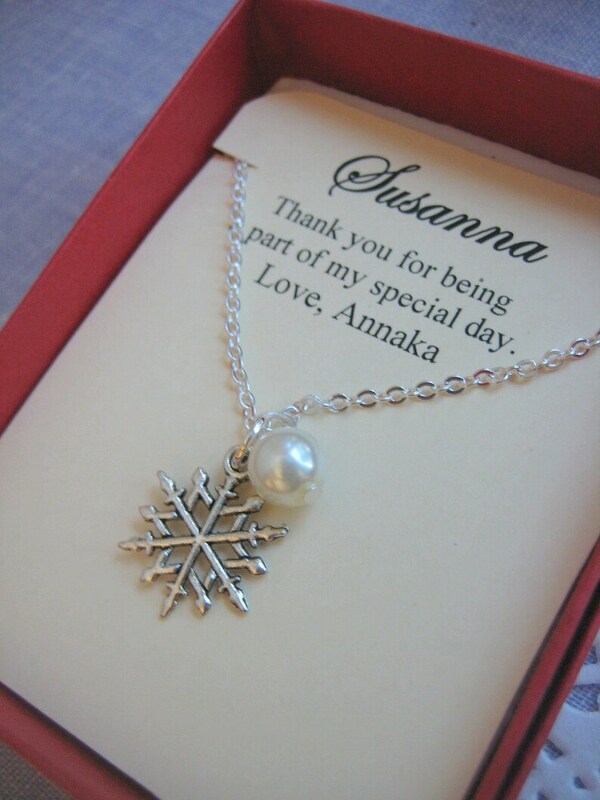 Absolutely loved the snowflake necklaces! I gave them as a gift to my bridesmaids to wear at my wedding and they loved them too! Ask Bridesmaid, seashell locket, initial, ocean inspired, bridal party gift. FREE personalized notecard and jewelry box. Ask Bridesmaid, seashell locket, starfish, ocean inspired, bridal party gift. FREE personalized notecard and jewelry box. Ask Bridesmaid, initial, Flower girl, Handstamped charm necklace. FREE Notecard Jewelry Box. Godmother, ask, handstamped Necklace. FREE Notecard Jewelry Box. Godmother, ask, handstamped, design, Necklace. FREE Notecard and Jewelry Box. Bridesmaid, glass pearl, bangle, bracelet. FREE Notecard & organza bag.